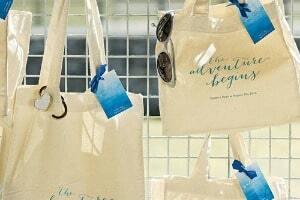 Are Free Wedding Packages Really…FREE? 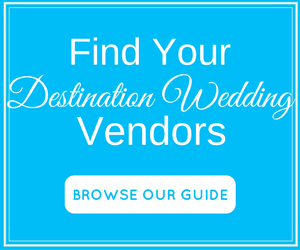 You are here: Home / Guide to Destination Wedding Packages / Are Free Wedding Packages Really…FREE? As you start searching for a resort to have your destination wedding at, you will inevitably come upon an advertisement for a “Free Wedding”. 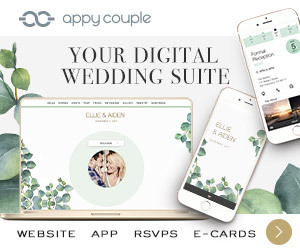 Once you read the ad or make a phone call, the confusion can really set in and you might ask yourself… “is my wedding really going to be free?“. 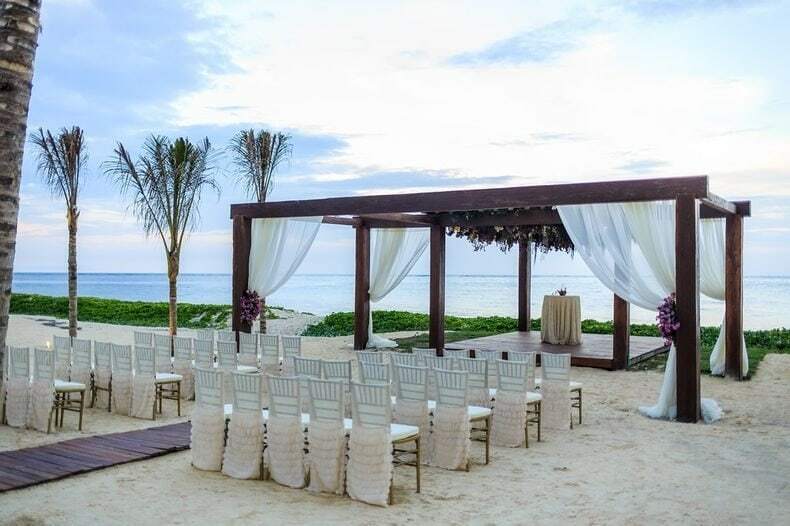 The simple answer is that yes, there is such a thing as a free wedding but each resort has it’s own definition of what a free wedding package includes and what the qualifications are for you to receive the complimentary wedding. 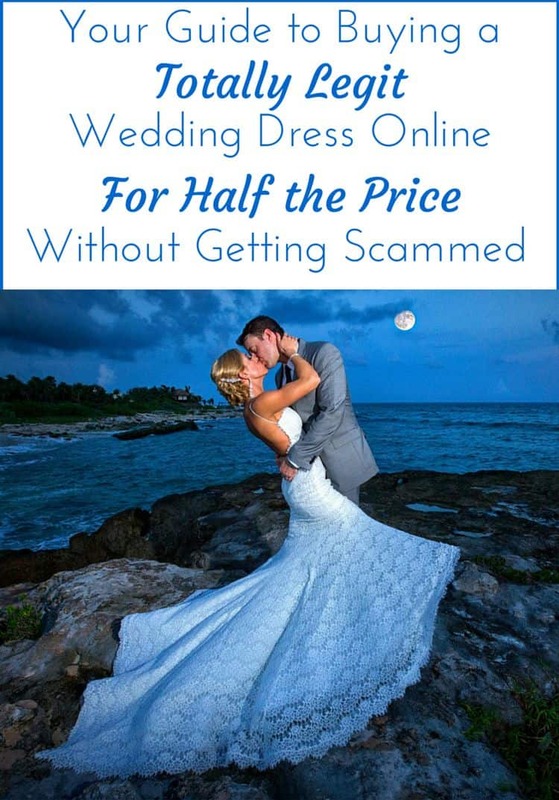 To help you better understand this, I teamed up with destination wedding pro Jack Benoff from Vacationeeze, to give you an in-depth look at the various FREE Wedding packages available at some of the most popular resorts companies in the Caribbean and Mexico. These resorts are all-inclusive resorts, which means that for one price you and your guests will receive your stay, food, drinks and activities. Dreams Resort & Spa has 15 properties in Mexico and the Caribbean, which all offer a high level of luxury for couples and families in ideal beachfront settings. With spacious and luxurious rooms and suites, Dreams provides a picture-perfect vacation experience with welcoming service and romantic inclusions. Each resort has 5-8 restaurants and almost as many bars, in addition to free room service in all rooms. What’s Included in the Free Wedding Package? 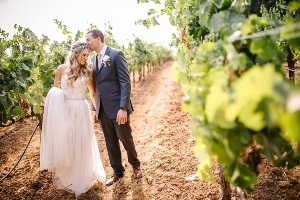 A wedding coordinator, a symbolic wedding ceremony, bouquets and boutonniere, preparation of your attire on the day of the wedding, wedding cake and sparkling wine toast for up to 10 guests, romantic turn down service and 15% off spa treatments. It also includes free nights for your anniversary stay, as well as a free massage for the bride and groom and a private candle light dinner on the beach. You need to stay at least 7 nights in certain preferred club rooms, which vary by resort; or book 5 rooms for yourself and your guests with each one staying at least 3 nights. Locations and times vary by resort. There is a fee for a judge or minister to perform the ceremony. There may be a fee to use certain venues at the resort. YES the wedding ceremony is free as long as you stay long enough in a qualifying room or book enough rooms. You can add fancy décor and music to the ceremony. You can also add a reception or cocktail party. Dreams also has many other packages that start at $2,500 and include everything you can think of. Palace has 8 all-inclusive resorts in Mexico and Jamaica. Some of the resorts are couples-only and some are family friendly. What they have in common is great rooms with a Jacuzzi right in the room, liquor dispensers in the room, and plenty of activities. Services of a wedding coordinator, ceremony location, chocolate colored ceremony structure with ivory spun fabric and floral appliqué, chocolate colored ceremony podium with two floral spheres as table décor, , silver branches for front of chocolate colored structure, bridal bouquet of 20 roses, themed boutonniere, themed wedding cake, justice of the Peace or Minister to perform legal, symbolic, or vow-renewal ceremonies, 30 white avant-garde chairs, sparkling wine during ceremony, one dinner reservation for up to 30 guests, discounts on photography, breakfast in bed the morning after the ceremony, CD system for the ceremony, and a complimentary honeymoon package. Just book a stay of 4 nights or more in a required room category; or book 5 rooms for 3 nights or more. Yes the Palace wedding package is free. Palace offers many other upgrades to their package. 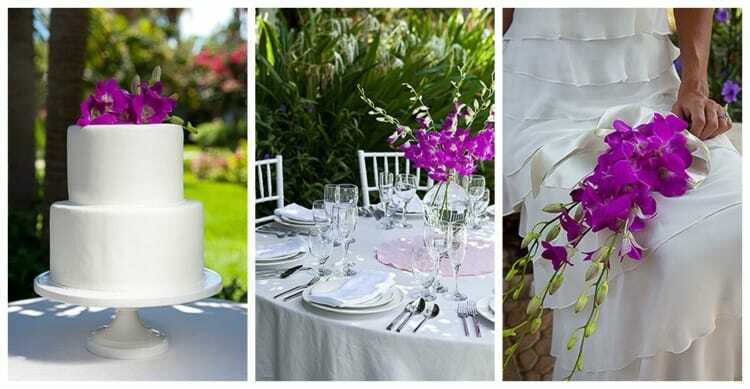 One of the true benefits of having your wedding at the Palace Resorts, is that if you book 10 rooms with guests staying 4 nights or more you will earn up to 9 hours of free events. Those events could be private cocktail parties, private welcome parties and even a full sit down reception dinner. Plus, your guests will earn up to $750 per room in resort credits they can use for excursions, room upgrades, spa treatments and many other things. Now Resorts are family friendly all-inclusive resorts located in Mexico and Punta Cana. Each resort has multiple restaurants and bars and has a no-wrist-band policy so you don’t have to worry about tan lines in your pictures. 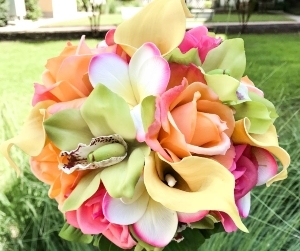 The resorts offer many wedding venues as well as constant activities for you and your guests. 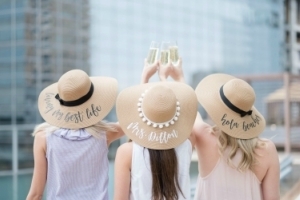 Includes items such as a wedding coordinator, a symbolic wedding ceremony, bouquets and boutonniere, preparation of your attire on the day of the wedding, wedding cake and sparkling wine toast for up to 10 guests, romantic turn-down service and 20% off spa treatments. You need to stay at least 7 nights in a preferred club room, which vary by resort; or book 5 rooms for yourself and your guests each staying at least 3 nights. YES the wedding ceremony is free as long as you stay long enough or book enough rooms. You can add fancy décor and music to the ceremony. You can also add a reception or cocktail party. Now Resort also has many other packages that start at $2,500 that include everything. 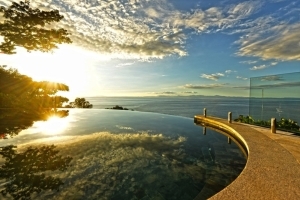 Secrets offers 15 resorts in Mexico, Jamaica, Costa Rica and the Dominican Republic. The resorts are 5 star all-inclusive and adults-only. Secrets prides itself in providing your guests ultimate luxury which includes 5-10 restaurants at each resort, 24 hour room service in all room categories, top shelf brands served at all bars, free wi-fi and phone calls back to the US, and much more. A wedding coordinator, a symbolic wedding ceremony, bouquets and boutonniere, preparation of your attire on the day of the wedding, wedding cake and sparkling wine toast for up to 10 guests, romantic turn down service, complimentary room for one member of the wedding couple the night before the wedding, 15% off spa treatments, special turn down service and up to 2 nights free for your anniversary trip. You need to stay at least 7 nights in certain required room categories which vary by resort; or book 5 rooms for yourself and your guests each staying at least 3 nights. YES they do offer a nice free wedding package. 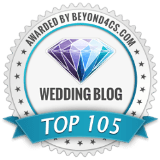 One of the great things about Secrets is that the wedding planners are based at the resorts and you are typically dealing with one person from start to finish. They also offer several other packages that are not free but are a great value. For example, The Secrets Ultimate Package is priced from $2,999 and offers everything you can dream of including: onsite wedding coordinator, service of judge or minister, preparation and ironing of the couple’s wedding day attire, hair styling and make-up application for one member of the wedding couple the day of the ceremony, live Mexican music trio (1 set, during cocktail hour), wedding cake, toast for up to 20 guests, plus a private cocktail party and reception for up to 20 people with many options to choose from. The package also includes wedding photography and video. El Dorado has 4 Gourmet Inclusive resorts in Mexico, and Azul has 4 gourmet inclusive resorts in Mexico and Jamaica. They are known for their upscale food, top shelf brands of liquor, service of their staff and their ability to customize any event you can imagine. Your guest will all receive 24 hour room service no matter what room they stay in. 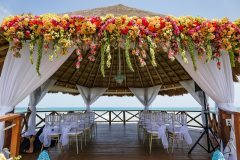 Both Azul and El Dorado Resorts are known for their Sky Weddings, which are 100% private roof top venues with views of the ocean. 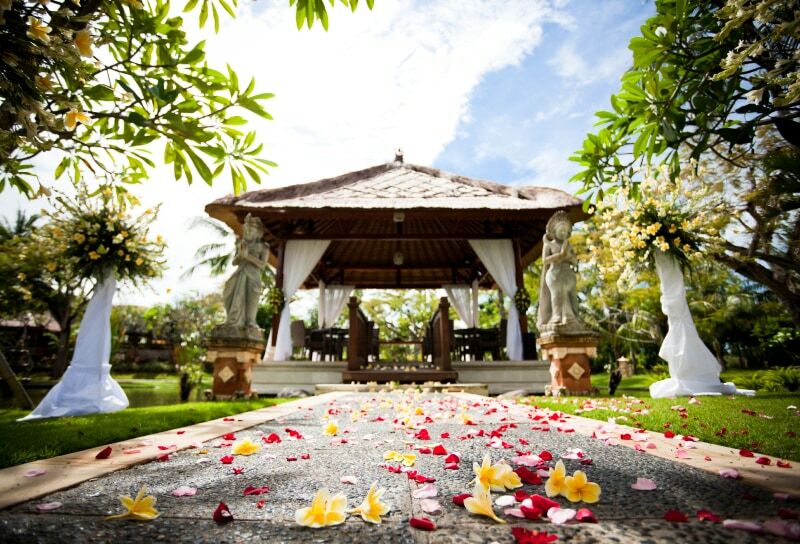 Romantic ceremony location with special aisle runner, white garden chairs and use of the sound system and microphone. They will provide a non-denominational minister, a wedding certificate and witnesses (if needed). The package includes a dinner reception in one of the resort’s restaurants with personalized menu cards. Also included is one of their ‘Signature Wedding Designers’, an onsite attendant for 3 hours during the wedding, groom’s room the day of the wedding with special bites. You’ll also get a honeymoon package that includes a private candle light dinner on the beach, special breakfast in bed, 15% off spa services and a one night return stay voucher. You must stay at least 7 nights in a specific room type which varies by resort; or book 5 rooms for 3 nights each for your guests. Features differ by resort and are based upon availability. 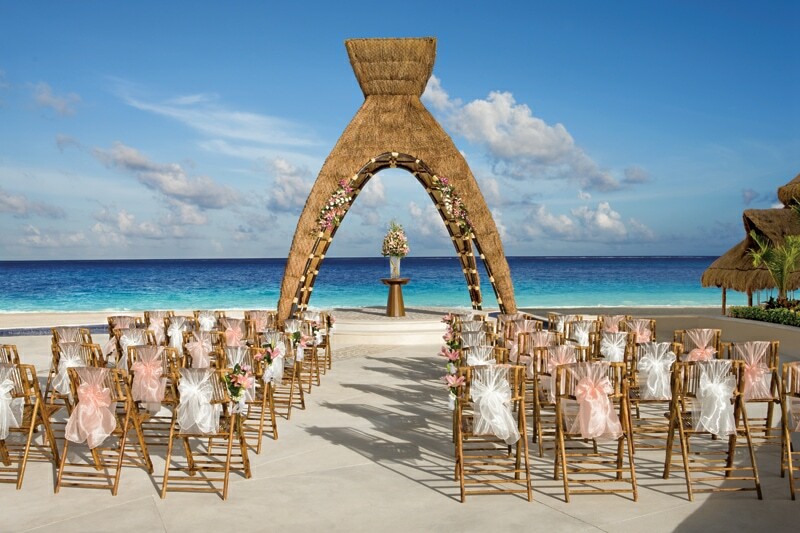 Yes, both El Dorado Resorts and Azul Resorts offer a comprehensive FREE wedding package. They also have many upgraded options and décor packages. Their design team is one of the best around. The chef’s can custom design any menu you can dream about. 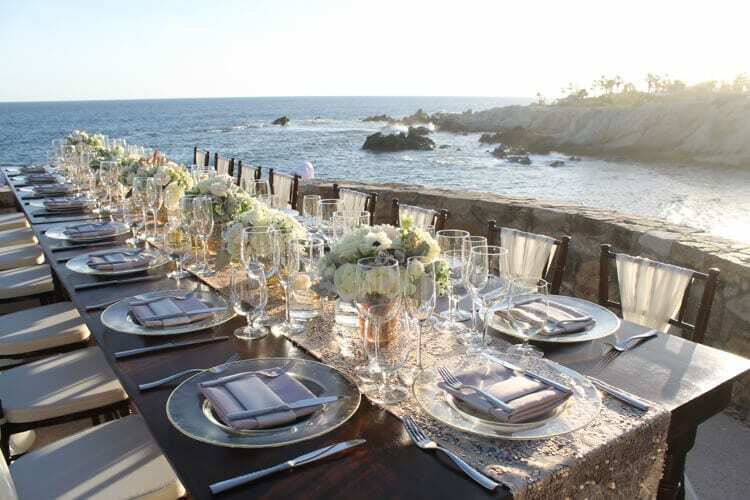 At times they offer a Private Event promotion that gives you free cocktail parties and a free 3-course sit down reception for lunch or dinner and the menu even includes surf and turf. Hard Rock has resorts in Mexico and the Caribbean. If you are looking for an upscale active vibe with many activities to keep your guest busy, good food, and good entertainment, then Hard Rock is the place for you. Hard Rock has partnered with famed wedding planner Colin Cowie to create amazing wedding packages. Justice of the Peace or minister to perform a legal, symbolic, or vow renewal ceremony plus wedding ceremony location, white ceremony structure, white ceremony podium with a golden manzanita branch and a gold mirrored vase filled with white roses, 32 white avant-garde chairs, themed one-tier wedding cake for 32 people, bridal bouquet and groom’s boutonniere, sparkling wine for 32 people during ceremony, CD system available during the ceremony, wedding planner, witnesses (if required), and a complimentary honeymoon package. Couple must stay at least 6 nights in a qualifying room; or book 5 rooms for 3 nights or more for their guests. Hard Rock does offer Free wedding packages. 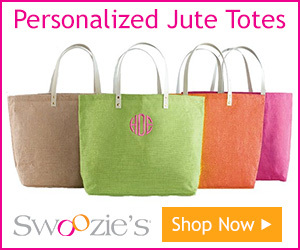 They also offer a variety of décor packages and upgrades. One of the great benefits of Hard Rock, is that depending on how many rooms you book for your guests, you will earn free events such as welcome parties, private cocktail parties and even a 3-course sit down reception or buffet. With only 25 rooms for 3 nights or more, you will get a free reception and a free cocktail party. In addition, guests will receive up to $1,500 in resort credits per room that they can use for the spa, excursions, swimming with the dolphins, room upgrades, and at the saloon. Sandals is known for their 5-star couple-only resorts. Sandals has 15 resorts in the Caribbean including Jamaica, St. Lucia, and Antigua. Sandals Resorts are made for couples. If you want to be active, Sandals has a lot to offer as one of the few resort companies to offer motorized water-sports such as Scuba diving and snorkel trips. Orchid boutonniere and bouquet, elegant table setting for 8, two-tier wedding cake, personal resort wedding planner, romantic wedding locations, preparation of marriage documents, white Chiavari chairs, music during ceremony, 30 minute sparkling wine and hor d’oeuvres reception for up to 8, 30 minute foot massage for groom, manicure for bride, special turn down service, breakfast in bed, and a special picture from the event. Plus receive $500 towards a custom wedding theme décor package or private events, $500 towards a room upgrade, and $200 towards wedding photography. Just stay 3 nights or more in a required room category. There are additional charges that vary by resort for the minister and/or government documents. 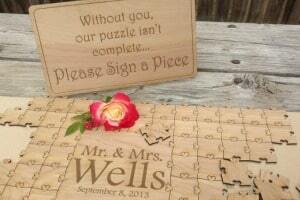 The extra wedding gifts require a stay of 6 nights or more. 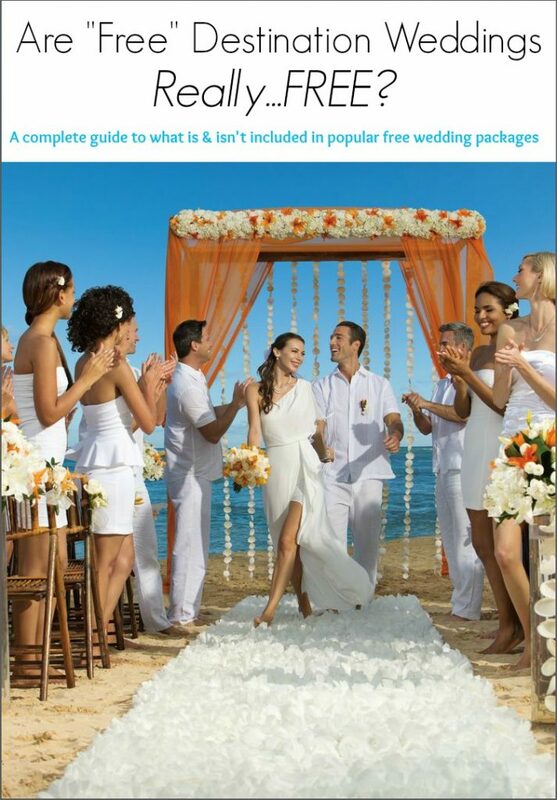 Sandals does offer a nice free wedding package. They also offer many great options and upgrades. At various times of the year they offer promotions to earn free events as well as resort credits. 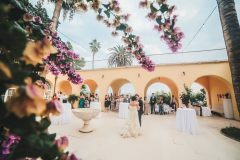 These are some of the most popular wedding resorts and as you can see the answer is truly, yes, you can receive a FREE wedding. Each resort is constantly changing their offers but the highlighted resorts usually have some type of free wedding offer. 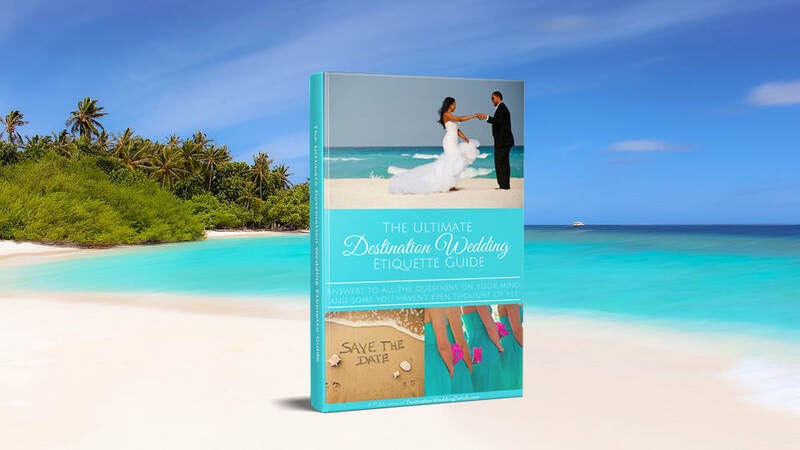 It is important that you work with an experience travel professional that is well versed in how to help you create a stress free destination wedding. 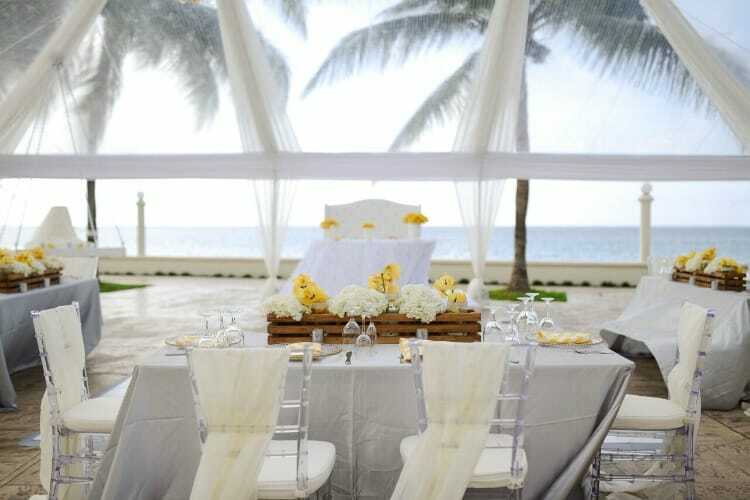 While it is nice to receive a free wedding, it is important that you select the right resort because a free wedding at the wrong resort can leave you or your guests with a negative experience. 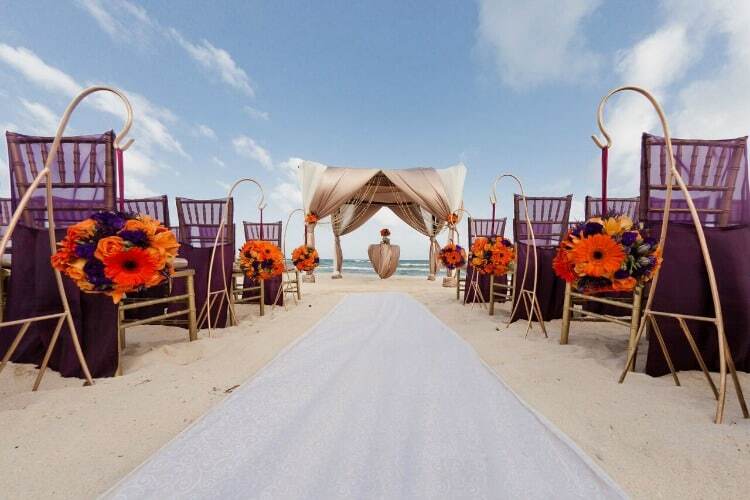 Companies such as Vacationeeze have been helping couples create and host their dream destination weddings for years. 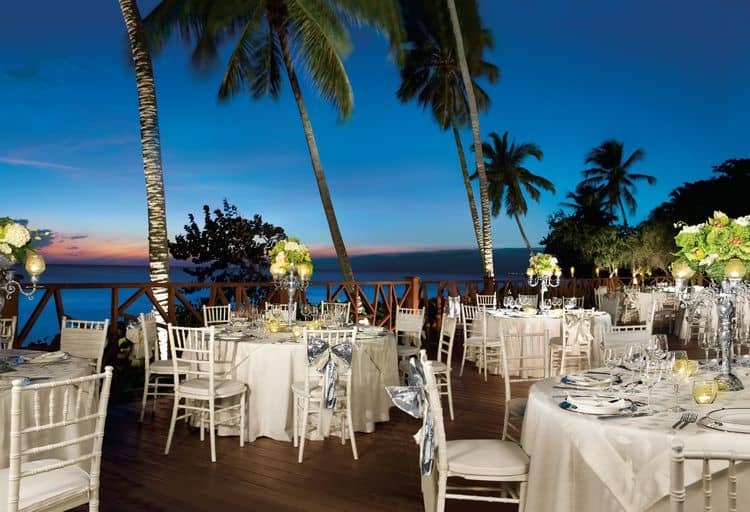 Because of their experience and relationships with the resorts, the team at Vacationeeze should also be able to provide you other FREE perks such as free rooms for the bride and groom, free resort credits for guests at the resort, free spa treatments for you and your guests, free airfare for the bride and groom and much more. The important thing is to find a resort that matches your dreams and budget so that you will be the most important guest at your event. For more information on the most up to date offers and promotions from these and other resort please feel free to contact Jack Benoff at Vacationeeze at jack@vacationeeze.com or 215-454-2080. You can also fill out the form below and Jack will contact you directly.